County in the 1880 Illinois census. Henry could have moved to Missouri, and Garrett is said to have moved to Montana. Bridget married James Tyman on Feb. 13, 1868 in Grundy County officiated by Father Francis Ryan. Newspaper Obituary: "George M. Waddell age 79, until recently of the Brookside hotel passed away at the home of his daughter Mrs. C. Bohn, 5406 Forest, July 19, 1942. Survived by another daughter, Mrs. Edward T. Clark, New York, sons T.J. Ross Waddell 6133 Oak; G. Cecil Waddell, Tulsa, Okla; one brother, Mr. Emmett Waddell, Niantic, Ill., 3 grandchildren, Beverly Bohn of the home, Berry Mae Waddell, Tulsa, Okla, and Romaine Waddell, 6133 Oak. Funeral services at the Funeral Home, Linwood blvd and Euclid 2:30 Tuesday afternoon. Interment Forest Hill cemetery." "George M. Waddell was a retired representative of Farm Implement Houses, age 79, died last night at the home of a daughter, Mrs. M. C. Bohn, 5406 Forest avenue. his health had failed rapidly since the death of his wife, Mrs. Margaret Waddell, three weeks ago. 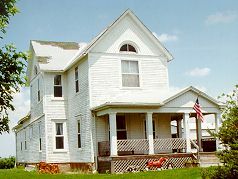 He was a retired manufacturer's representative for farm implement houses, and had been a resident of Kansas City thirty-five years. 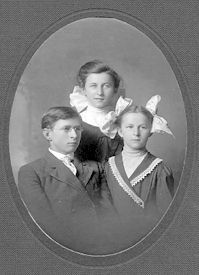 Surviving are another daughter, Mrs. Edward T. Clark of New York and two sons, T. J. Ross Waddell, 6133 Oak street and G. Cecil Waddell of Tulsa." "Mrs. Margaret Waddell, age 77, Brookside hotel, passed away at the home of her daughter, Mrs. M. C. Bohn, 5406 Forest, June 29, 1942. 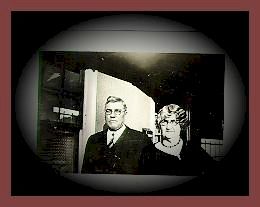 Survived by her husband, George M. Waddell, Brookside hotel, another daughter, Mrs. Edward T. Clark, New York, sons T. J. Ross Waddell 6133 Oak, G. Cecil Waddell, Tulsa, Ok., sister, mrs. Elizabeth Kinney, Decatur, Ill., brother A. M. Henneberry, Chicago, 3 grandchildren, Beverly Bohn of the home, Betty Mae Waddell, Tulsa, Ok and Romain Waddell 6133 Oak. Funeral from the Funeral Home Linwood and Euclid 2:30 Wednesday afternoon. interment, Forest Hill cemetery." 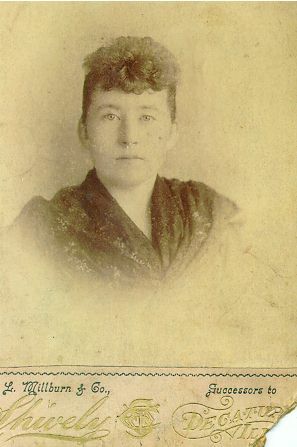 Teresa born 1873. Died Dec. 21, 1889 at age 16 in Dalton City, IL buried in St. Isidore Cemetery. Teresa who was called"Tressa" died just before Christmas of a virulent form of diptheria. Her sister, Margaret and her six week old son Ross were back home at the time. As Tressa was dying she said, "Margaret, your little kid won't take it. No on will take it." No one else in the family contracted the deadly disease. "The marriage of Miss Vera Dunne and Bernard Witt took place in St. Patricks Catholic Church Thursday morning at 7:45 oclock. The marriage ceremony was performed by Rev. Father Murphy. They were attended by Miss Aimee Dunne, sister of the bride and Francis Witt, brother of the bridegroom. The bride wore a brown Duvet de Laine suit with grey squirrel trimmings and hat and shoes to match. The bridesmaid also wore a brown beaver trimmed suit with corresponding hat and shoes. 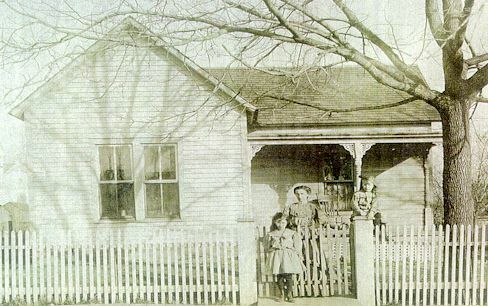 The wedding breakfast was served in the home of the brides parents, Mr. and Mrs. D. F. Kinney, 354 Main Street. The couple left immediately for Chicago. buried in St. Isidore cemetery. Aimee was named after her great Aunt, Aimee Magner.